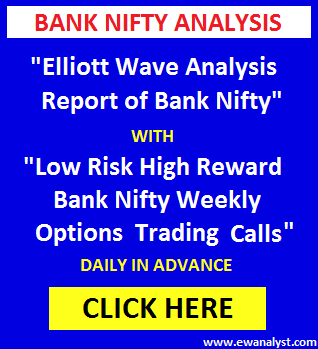 Bank Nifty opened higher at 26331, bounced to register day’s high 26490 but didn’t sustain at higher and declined back sharply by more than 1400 points to register day’s low 25053 followed by sharp bounce till 26034 and finally closed 680 points down at 25596. Overall, it’s very volatile move with up-down swing. Overall, Bank Nifty was expected to bounce sharply towards 28000-28300 in coming days whereas 26489 was the immediate resistance/breakeven point on upside and Bank Nifty was expected to bounce towards 26901-27000 if breaks/stay above 26489. 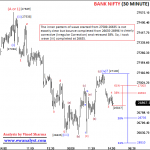 Otherwise, decline below 26235 was expected if fails to breaks/stay above 26489. Trading strategy was to hold Bank Nifty 27500 call of 27th Sep expiry [bought around 50 or below] till 27th Sep expiry without any stoploss. Bank Nifty 27500 call of 27th Sep expiry was closed at 5.40. Now, we need to analyze fresh charts to calculate further move. This is Daily time bar chart of Bank Nifty which I am expecting as start of wave  (explained in my all time frame report. Wave  may be completed with inner wave [i],[ii],[iii], completed till 25198, wave [iv] may be completed at 23605 as irregular correction and wave [v] may be completed at 28388. 23%-38% retracement of the wave  is placed at 25843-24269 and Bank Nifty already acheieved 23% retracement after breaking below 25843. So, 25053-24269 is the medium term support range on downside with 24269 as Brekeven point for short/medium term. Any bigger reversal can be expected after break below 24269 only. Now, we need to analyze the decline started from all time high 28388 on separate lowest time frame chart to calculate its inner waves/counts. 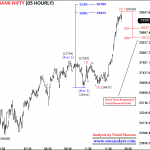 This is Hourly time bar chart of Bank Nifty covering move from all time high 28388. 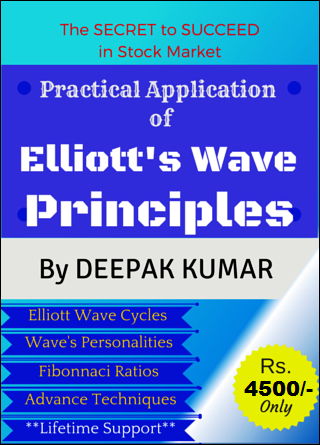 Wave completed from 28388-28185 may be wave (1), wave completed from 28185-28340 may be (2), wave completed from 28340-26555 may be wave (3), wave completed from 26555-27205 may be wave (4) and wave (5) may be completed at 25053 or still in progress. 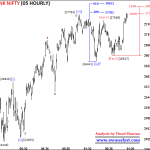 Wave (5) achieved its 100% projection placed at 25372 and becomes highly extended wave, whereas 123% projection for wave (5) is placed at 24939. 38% retracement of the progress of wave (5) is placed at 25875 which is the immediate resistance on upside and Bank Nifty if stays above 25875 then further bounce towards 26500-27200 can be expected. Now, we need to analyze bounce started from low 25053 on separate lowest time frame chart to check its pattern/immediate counts. 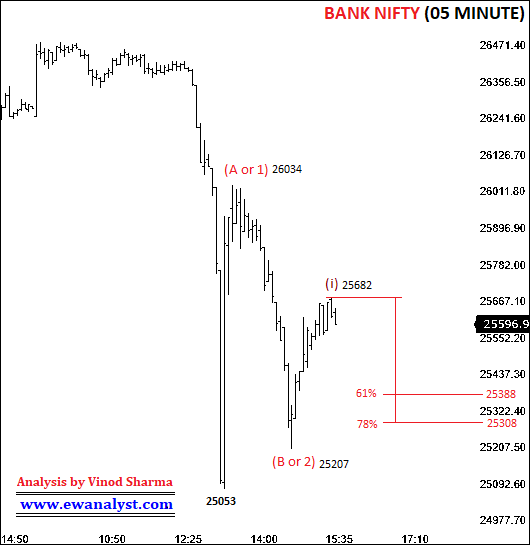 This is 05 Minute time bar chart of Bank Nifty covering move from low 25053. 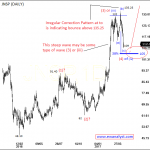 It seems wave competed from 25053-26034 may be wave (A or 1), wave completed from 26034-25207 may be wave (B or 2) and wave (C or 3) may be in progress. 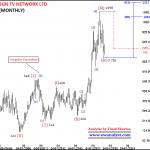 Within wave (C or 3), it seems wave (i) or (ii) may be in progress from 25207. 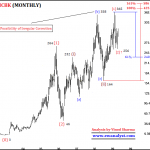 61%-78% retracement of the progress of wave (i) is placed at 25388-25308 which is the immediate support on downside. 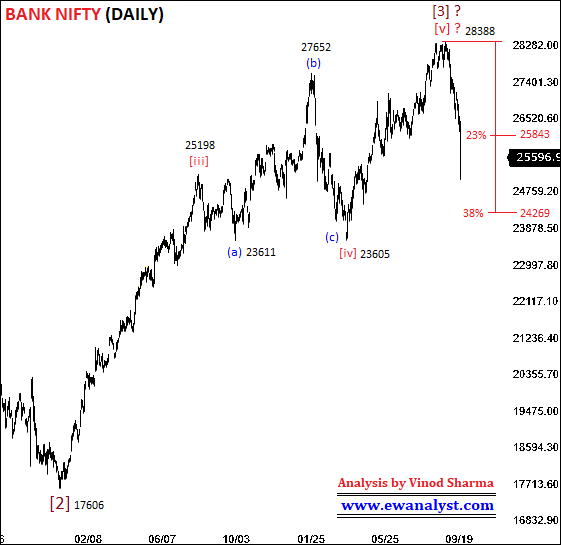 Now, Bank Nifty needs to bounce sharply to support these counts because we are expecting wave (C or 3) in progress and wave (C or 3) is known to be faster and larger. 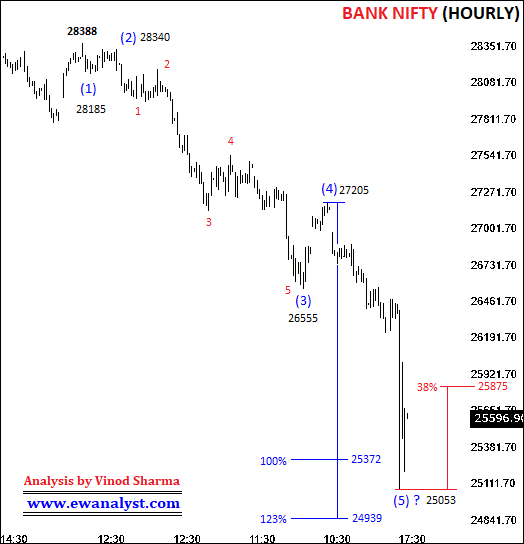 Bank Nifty completed a big downward Impulse of more than 3000 points from 28388-25207 and there is possibility of small or big reversal. Reversal can be towards 26500-27200 or towards new life time high. 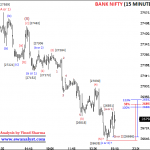 25875 is immediate breakeven point and Bank Nifty if trades above 25875 for 15 minutes can bounce further towards 26500-27200. 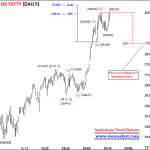 Personality wise, Bank Nifty needs to bounce sharply towards 26500-27200 to support the pattern because wave (5) of downward impulse started from 27202 is highly extended and we can expecting wave (C or 3) in progress. So, any consolidation below 25875 can also result in further fall for new low. Hedge Trade: – 25875 is breakeven point from where a sharp bounce towards 26500-27200 or decline towards 25200 is expected. So, 25875 is suitable point to decide hedge trade. So, Suitable Call and Put of 04th Oct Expiry can be bought in equally quantity if get Bank Nifty near 25875 expecting quick move of 600-1000 points either side in coming sessions. Buy call and Put of 04th Oct expiry which is trading around 60-70 (Both call and Put must be trading around 60-70). Options of 27th Sep expiry can also be used. Those who want to trade single side can buy 26500 Call of 04th Oct expiry in 60-40 range using stoploss of 27 expecting 120-180 as minimum upside targets.